Britons Set World Record For Most People Dressed In Star Trek Regalia? Just days after a lightsaber-wielding flash mob invaded Bristol, a slew of Starfleet Officers descended upon London on to celebrate the release of Star Trek Online. Organizers claimed it was the largest gathering of begarbed Trekkies ever, but how many showed? 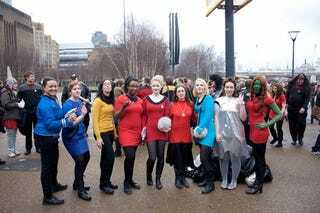 This Valentine's Day, 99 Trek fans showed up to the London Star Trek MMO event clad in cosplay - that number seems a tad but suspect, but regardless, it's nice to see unabashed Trek fans taking it to the streets. Plus, the world can never have too many Beverly Crushers. Well, unless they're evil, alternate dimension Beverly Crushers. Who'd probably have goatees, I guess. Also keep your eyes peeled for Jean-Luc Picard if he was seemingly played by Grant Morrison. Set all phasers to Barbelith!